In 1094 Oliver Herford published an illustrated parody of Omar Kahayyam's Rubaiyat featuring a kitten. 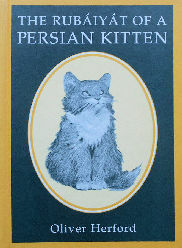 His Rubaiyat features the mis-adventures of a Persian Kitten. A reproduction of the original illustrations appears on each facing page. This re-publishing of the book is copyright 1993. The hardback book is 5 3/4" wide x 7 1/2" high. Approximately 30 pages; pages are not numbered. Previously owned but in good condition.